Fourth Row Center: Film Writings by Jason Bailey: On DVD: "Nick Swardson: Seriously, Who Farted?" 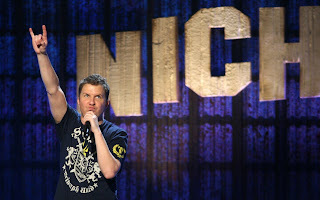 There’s something that bothers me about Nick Swardson, in spite of his considerable likability, and after watching the DVD of his new Comedy Central special Nick Swardson: Seriously, Who Farted?, I think I’ve figured it out: he’s playing down to us. On the surface, the affable comic seems to content to coast on relatable subject matter and frat boy charm—kind of a funnier Dane Cook (not that that’s terribly hard to be). But there’s more happening under that; in the best moments of his hilarious 2007 album Party, there’s a sense that he’s a little ahead of his audience, that he might be treading that fine line between being a boozy aimless schmuck, and playing a parody of one. The problem with pulling off an act like that is pleasing your audience: if the people who respond to you end up being the kind of guy you’re playing in your act, you might have to dial back the satire and just kind of be that guy. The new special, which premieres (in a shortened form) on Comedy Central a few days prior to the DVD release, is therefore pitched to that demo, and as a result, it isn’t nearly as smart or nuanced as the 2007 record (in all fairness, I could just be giving him too much credit; after all, his long association with the worst output of Adam Sandler’s company—including Grandma’s Boy and The Benchwarmers, both of which he co-wrote—don’t exactly indicate a hidden depth of intellectualism). The topics are all fairly standard—fast food, drinking, “drunk chicks,” dating, pot, and video games—and he doesn’t tackle exactly wring a flurry of new insights out of them. He’s a fierce defender of mindless blockbuster movies (lots of love for Transformers), and most of his cultural references are to video games. That’s not to say there aren’t laughs here—there are. Swardson’s material may not always be stellar, but his timing is impeccable, and he knows how to work a crowd. His best moments come not in the Cookian “observational humor,” but in his more personal moments of goofball storytelling. The tale of his first “massage” is a riot, particularly his description of the somewhat elderly masseuse (the massage is excellent, he says, “obviously—she’s been doing it for a thousand years”). The story of his Vegas trip and encounter with a high-fiving monkey is similarly amusing. And he does a very funny bit imagining a world where everyone becomes the first thing they ever wanted to be when they grew up (“Ninjas running around, princesses… quarterbacks throwing footballs to pirates…”). But just when he gets a good story going, the show turns into a fan club meeting, with inside jokes and references to his other projects. At one point, he gets very serious and says, “I wanna take the time to thank everybody for supporting the movie Grandma’s Boy,” and the crowd goes insane, and then he proceeds to tell ten minutes worth of stories about the making of that opus. That chunk of the special is strictly for all of you Grandma’s Boy “supporters,” and it’s not stand-up comedy, it’s audio commentary. In moments like that, good will goes out the door. He’s doing the kind of lazy, self-congratulatory material that made his mentor, Adam Sandler so rich—playing dumb, as he’s perhaps learned, makes smart business. On second thought, I’m probably taking the whole thing too damned seriously; I mean, after all, the special is titled Seriously, Who Farted?, so it’s probably not the place to look for high-minded wit. But Swardson, as a comic personality, is funnier than his middling material; the Grandma’s Boy fans he pays earnest tribute to will probably eat this up, but everyone else will want to stick with a rental. "Nick Swardson: Seriously, Who Farted?" premieres on Comedy Central Sunday, October 11th. The accompanying DVD and CD hit stores on Tuesday, October 13th. Nick Swardson is a hilarious man! I highly recommend going out and buying the DVD! It's filled with all sorts of great, hilarious content! You will not be disappointed! This DVD is fantastic.. Before this I only knew him from movies such as Grandma's Boy or his roles in Reno 911. This stand up DVD keeps me laughing the entire time.. a must have! Okay, seriously, how much are you plants getting paid to pimp this DVD?